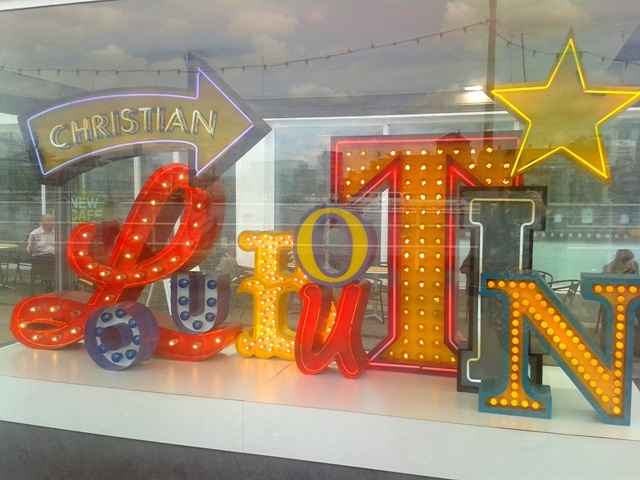 Last weekend I visited the Christian Louboutin Retrospective at the Design Museum in London. Louboutin is my favourite shoe designer, I'd love to own a pair of his iconic red soles one day! I love his work from his classic black patent pumps to his outlandish sequin and spiked heels. 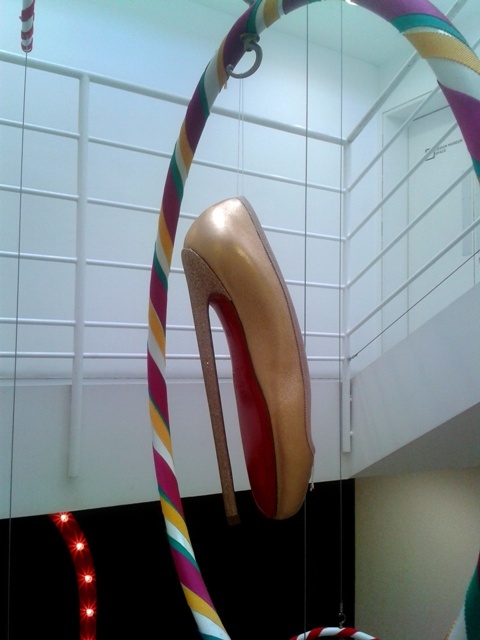 The exhibition charts Louboutin's career and celebrates 20 years of his famous shoes. 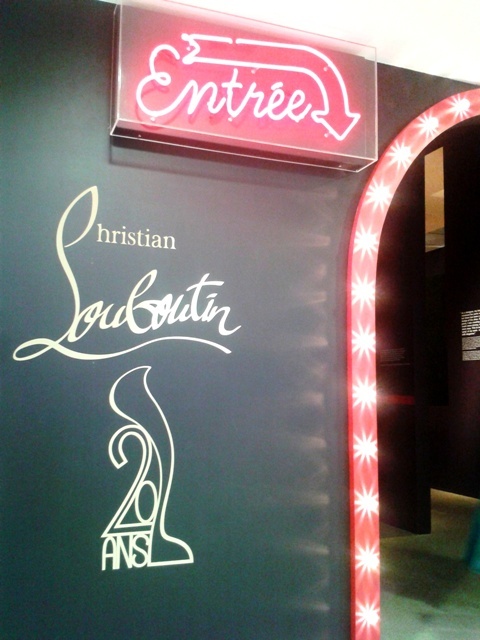 In 1981 Louboutin began working at Folies Bergere, the famous Paris music hall as an assistant to the dancers. In his spare time he'd sketch shoes for the girls. Louboutin was inspired by showgirls and their lavish costumes which are reflected in his theatrical feathered and bow designs. His shoes also reflect his passion for films and Hollywood screen starlets including Marlene Dietrich and Bette Davis. He saw them as survivors who could take on the world. He designs shoes for women's inner showgirl. He uses materials including veiling, chiffon, mesh, brocade and ribbon which increase the illusion of transparency and believes shoes should undress rather than dress leaving the foot as the object of desire. A giant shoe carousel displays some of his most famous designs and shows pictures charting his career with those who have influenced him along the way. You can see some of his most celebrated designs from the last 20 years including the Lady Page from his AW '09 collection, based on pin up model Betty Page the shoe is entirely curved reflecting women's femininity. Also on display are the shoes he created for YSL in 2002 for their last runway show featuring the YSL insignia in crystals, this was the only time another name joined the YSL house. At the centre of the exhibition you can sit in a giant shoe theatre and watch a holographic performance of burlesque star Dita Von Teese turn into a sparkling Louboutin shoe. There's also a Fetish section featuring a series of shoes created for an exhibition with artist and film maker David Lynch in Paris in 2007. Louboutin collaborated with Swarovski and the English National Ballet last year creating 8 inch heel ballet shoes. He believed these ultimate heels made dancers closer to the sky and therefore closer to heaven. The exhibition explores how his shoes are created from his initial sketches to the manufacturing process. In celebration of 20 years as one of the most renowned high fashion shoe designers Louboutin released an anniversary collection earlier this year featuring 20 shoes, one for each year of his success. He was also invited by legendary Parisian cabaret 'Crazy Horse' to design 4 new tableaux. The exhibition runs at the Design Museum in London until July 9th. Are you a Louboutin fan? Have you visited the exhibition yet? Thanks for sharing this will have to show my cousin she is a complete louboutin obsessive! Sounds like an awesome exhibit! Amazing pictures! A friend of mine went to the launch but was told off for picture taking. I would love to go to the exhibition but alas don't have time to go to London before it closes! I don't know if I have time to see this but I definitely would love to. The Design museum is such a great space for art exhibitions, I've seen one of my favourite exhibitions (Chalayan) there! 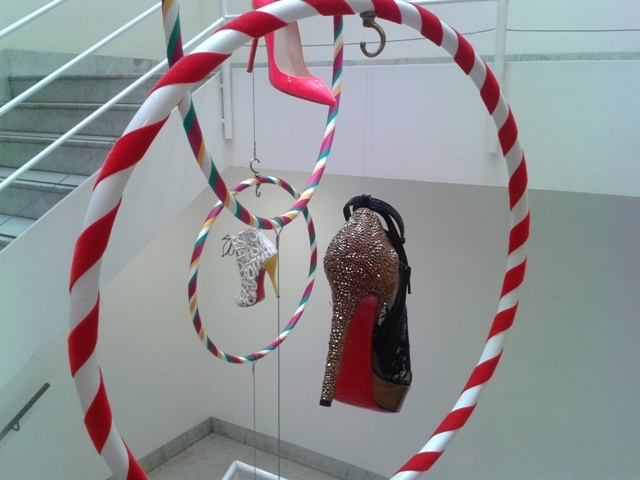 Shoes ARE art... Looks like a beautiful exhibition! Looks like an awesome exhibit! They would be hard to save up for, but so worth it in the end! I need more willpower! AHH CAROLINE! It's not fair you get to go to all these places, I am so jealous. I'd love to have been able to see what inspires the shoe designing genius! Very Cirque De Solieu! I like quirky things I do. I LOVE Louboutins! I think they are sooooo gorgeous and totally want want want to own a few pairs when I can finally afford to :) You are so lucky to be able to see this exhibition!